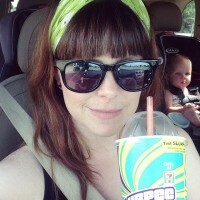 Handmade Detroit | Crafty Saturday! Two big local semi-annual crafty shopping traditions are this Saturday! 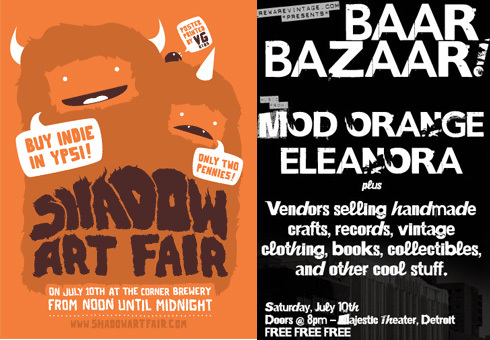 Shadow Art Fair in Ypsilanti, organized by the Michigan Design Militia, is hosting 37 of Michigan’s creatives from noon – midnight at the Corner Brewery. This years Shadow features artist and collectives such as The Silent Giants, Modati Clothing, Ann Arbor Film Festival, Cupcake-O-Matic and our own Carey from Glass Action! Admission is just 2 pennies, and benefits the Shadow Arts Grant. The Shadow Art Fair is all ages from noon-3:00, all ages with a parent until 9:00, and 21+ from 9 pm-midnight. In addition to shopping, there will also be live music and fun activities for kids and adults at the Brewery, Spur Studios, The Dreamland Theater, and the Savoy, with a vegetable oil powered shuttle bus to take you around! After checking out Shadow, head to Midtown Detroit for the 5th anniversary of the summer Baar Bazaar! Hosted by Reware Vintage, the Baar Bazaar runs from 8pm-2am at the Majestic Theater. Grab a beer and shop with 30+ vendors, selling handmade crafts, records, art, books and vintage everything from Pyrex to toys, movie posters to T shirts! Admission is free, open to all ages, and Mod Orange and Eleanora will be performing while you get your shop on! Check out the entire vendor list here.